If you have ever seen children don a plastic tiara or crown, you’ll know they have fun embodying the spirit of royalty, despite knowing the crown isn’t made of real diamonds or gold. 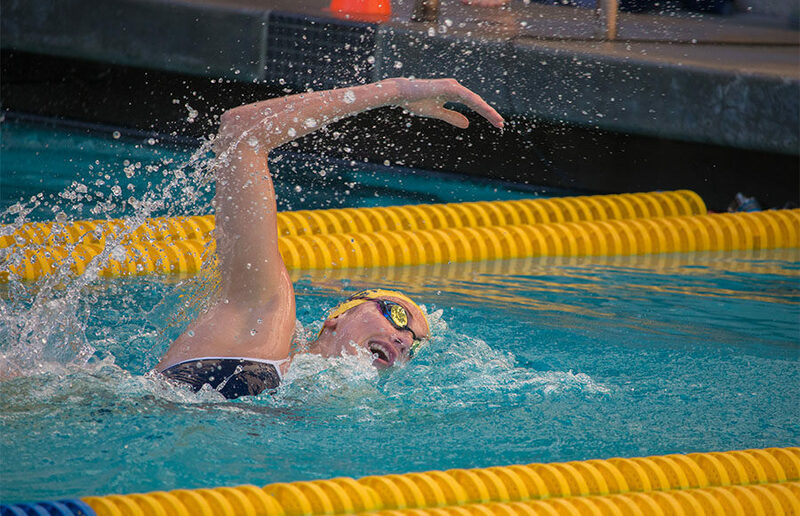 The last time Cal women’s swim hit the water for competition, a national championship trophy was on the line, but in its Queen of the Pool opener, a sparkly crown is at stake. While the prize is less glamorous than a championship trophy, it is still fundamentally important to the start of the season. Junior Kathleen Baker was last year’s Queen of the Pool, and she adorned the blue crown with a smile just as big as when as she received her silver medal from the Rio 2016 Olympics. While the two prizes don’t hold the same value, both awards were only achieved after rigorous training, and for the Bears, this lighthearted meet is the beginning of the road to redemption and another campaign to Nationals. “I think our team has done a good job of working together this (off)season, and I’m really excited to see what we can do,” McLaughlin said. This meet is uniquely different from all the others during the season. Typically, swimmers have one to two events that they zero in on and master — but this meet demands that the queen of the pool be the Jack-of-all-trades. Each member of the team competes in five 100-yard races: breaststroke, butterfly, backstroke, freestyle and individual medley. The times are then combined, and the swimmer with the fastest overall time is named queen. Cal owned last year’s meet against Cal Poly San Luis Obispo, and all but one of the top-18 finishers belonged to the blue and gold. With such a large, established program, the Bears will likely show up and show out just as dominantly as last year. Baker finished last year’s meet with a combined time of 4:43.28, and her success was credited largely in part to her dominance in the individual medley race. Her victory ended the three-year reign of former Bear and then-senior Celina Li, and it won’t come as a surprise if Baker manages to claim the crown for the second year in a row. Junior Amy Bilquist, who took third overall, stood out in the 100-meter back, finishing just over 2 seconds in front of her competitors. The backstroke is one of Bilquist’s signature events and an event she will have to perform seamlessly in if she wants to give Baker a run for her money. Sophomore Abbey Weitzeil and McLaughlin took fourth and fifth, respectively, and while they may have a tough time getting the crown atop their heads, both swimmers are capable of cracking a top-three mark and improving on their previous year’s time. This meet will be the first time the returning swimmers will get a chance to compete with the freshmen, and competition runs in the blood of the fresh-faced. With 11 new members, including a Rio Olympian, it is likely that they will all be gunning to compete with the consistently great Baker and their more veteran teammates. No matter who gets crowned queen, the Bears will look to bring the title back to Berkeley.